How Safe are our Rural Roads? This Roadway Violation took place September 5th, eastward bound on County K in the Town of Pierce, Kewaunee County. While signage of “Be prepared to Stop” and “Men working” was placed on the roadway, no roadway assistance or flagmen were on site to maneuver drivers through conditions including a light rain, a double line no passing zone, and a blind hill. How safe are our rural roadways? 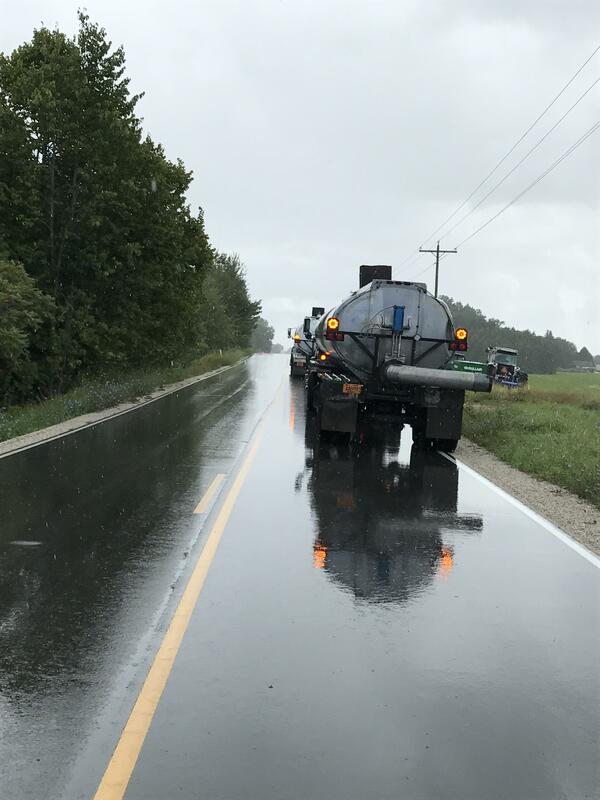 Several rollovers involving milk tankers and manure haulers have occurred in northeast Wisconsin– becoming commonplace. Speed is often a factor. One day prior to this violation a milk truck crashed in our community; luckily no one was injured. Photo documentation, time/date, and a call to law enforcement resulted in a citation given for this offense. On September 19th, at the town meeting in Pierce where the violation occurred, Sheriff Matt Joski stated, “We have all been patient and we have educated as much as possible. It is now time to back up our message with action”. it is interesting to note that he states, “After prodding from environmental groups and some rural residents, the Department of Natural Resources is targeting 15 counties, including those of metropolitan Milwaukee, for certain manure-spreading standards”. Some rural residents? What exactly do rural residents have to do with the pollution that has contaminated their water source in their homes, sullied the landscape, lowered their property values, and left them with serious quality of life issues? For too long average residents, who have plenty to say, and are living with the consequences of intensive industrial farming where they live— are left out of the conversation. Instead the media focuses in on “environmentalists” and their concerns–seemingly pitting industry vs. environmentalists. Rural residents? Not radical environmentalists? Prior to being labeled “Environmentalists” most concerned rural residents are just that–homeowners seeking social and environmental justice where they live. An independent lot, many country dwellers are not “joiners” and feel confident in their own abilities to represent themselves and do not feel the need to join organizations therefore pigeon-holing them into a status of “environmentalist”; “radical”; “anti-farming”; and the numerous other labels attached to those who vocalize injustice where they live. Rural residents are, and should be— the voices heard from the rural countryside and other communities. Kewaunee CARES thanks those residents, whoever they may be, for being that voice amid the blowback that it sometimes entails, and the example that Environmentalists are merely “residents” whose resolve and commitment to the land, air, water and our communities— will not allow them to give up.